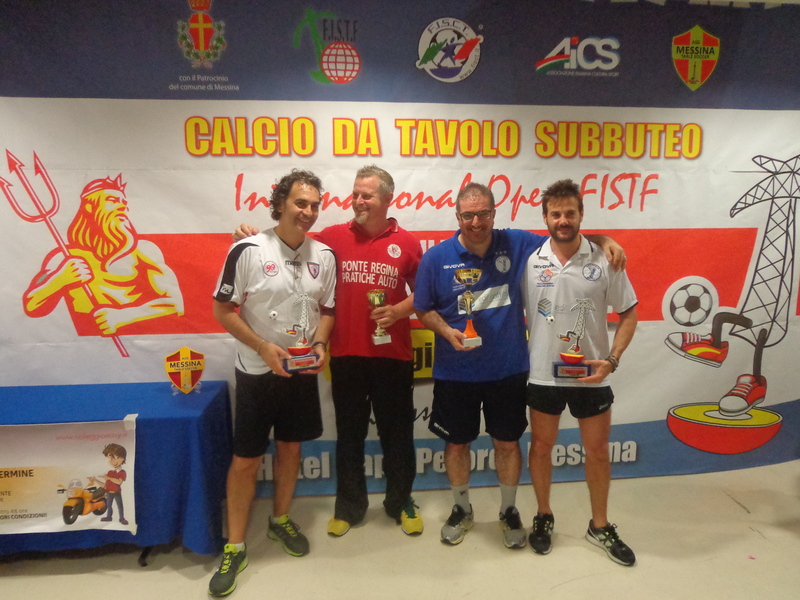 Great participation in the International Open FISTF “VIII Trofeo Città di Messina”, organized by Messina Table Soccer Messina in Capo Peloro, in the tip of the north of Sicily ..More than an hundred athletes entered in individual categories on Sunday, while 13 were the teams in Saturday’s competition. The team tournament was won by Catania, who defeated Ascoli in the final. Excellent semifinalists Reggio Calabria and Siracusa. The Open tournament was won by Christian Filippella, who defeated 2-1 in the final teammate of Eagles Napoli Massimo Bolognino; in the semifinals came Hansel Mallia and Claudio La Torre. Massimiliano Schiavone defeated at the sudden death Marco Perazzo in the veteran final, where the semifinalists were Giancarlo Silvestri Paolo Finardi. The winner in the category ladies was instead the sicilian Giuditta Lo Cascio, on teammate Rosalia Filippone. From Messina all other category winners: Fabio Aragona (finalist Andrea Bolognino) in the Under 19, Riccardo Natoli in the Under 15 (finalist Ignazio Mosca) and even Riccardo Natoli in the Under 12 (finalist Roberto Saitta). This entry was posted in FISTF News. Bookmark the permalink.